Cut out a back the same size as the front and put a matching band on it. Using a 1/4 inch seam, sew the front to the front lining and the back to the back lining as per illustration. Iron the seams towards the outside ends. 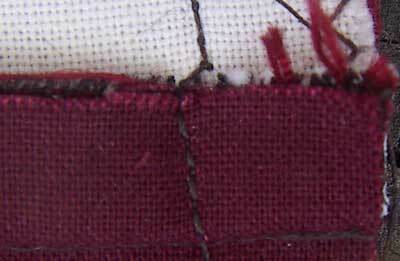 Place front/lining unit right sides together with the back/lining unit, matching the joins…Stitch together using a 1/4 inch seam, leaving a gap in the straight section of the lining. Another Optional refinement…At the fold line of the outside and lining, (which is at the edge of the seam if you have cut lining shorter or on the seam if you have cut the lining the same size as the outsides) increase the seam allowance by about 1/16th of an inch, this makes the lining slightly smaller so that it fits inside better. Clip curves on the outside pieces (it is not necessary to clip the curves of the lining). 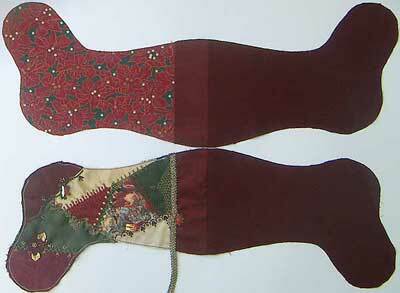 Turn stocking right side out through the gap in the lining. Before slip stitching the Gap Closed I stitched the Braid across the back of the stocking top…I wasn’t going to bead the back section of the braid but it did look a bit bland…and is beaded. 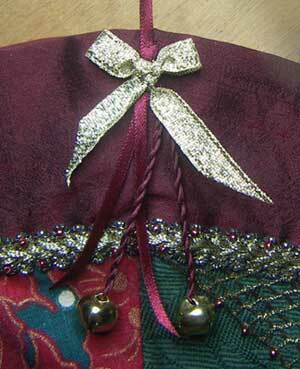 The bells are hung with Twisted Ribbon, for which you can use silk or satin ribbon or thick threads. I Finished the top with a bow tied with a metalic gold ribbon. 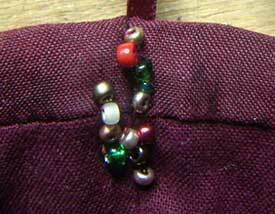 A TIP…When stitching the Hanger and Trim on, thread on a bead each time the needle is at the back of the fabric…This turns the potential mess at the back into a sparkling secret. 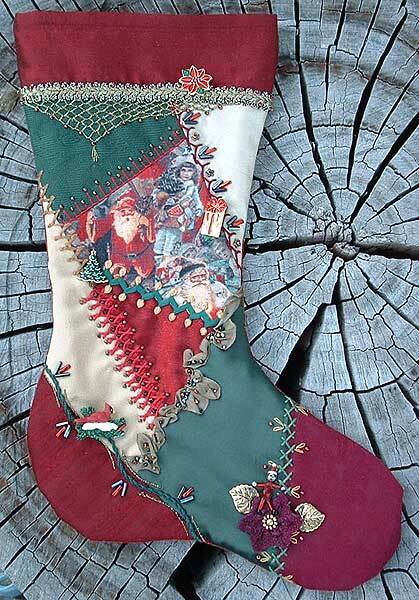 Add your name and the date and your stocking is finished. I love it, I think it is perfect! That came out wonderful! I love all of the little details that you put into your work. Thank you for the lesson on constructing the stocking, this will work alot better then the way I did my first stocking. Thank you. Hi there…I Googled for ribbon bow, but found your page about Crazy World…and have to say thanks. nice read.